All Disney products are good sellers on eBay. Items like costumes, collectible Christmas ornaments, plush, snow globes, and Disney park memorabilia can sell for high prices. Even though obsolete in today's society of Netflix, Hulu, Amazon streaming video, and cable TV, some Disney VHS tapes can sell for hundreds of dollars on eBay. One such VHS tape is the Little Mermaid VHS with original cover art. First of all, it is important to understand that not all Disney VHS tapes are valuable. One particular rumor on the internet states that of Disney Black Diamond VHS tapes can sell for thousands. This is definitely a rumor and not the case, and the Disney Black Diamond rumors are simply a hoax. As such, not all Little Mermaid VHS tapes are valuable. There is, however, a specific version of the Little Mermaid VHS that has an error in the cover art. The original cover shows Little Mermaid Ariel sitting on a rock with Prince Eric, with her father and Ursula in the background, and her friends Sebastian the lobster and Flounder the fish in the foreground. In the far background, situated just between Triton and Ursula, is a golden castle with tall cylindrical spires. This is where the interesting cover art is found. What Is So Controversial About the Little Mermaid VHS Cover Art? One of the spires is said to look like a male human body part, and not one that should be on the front of a Disney VHS video cover or associated with a G rated Disney movie. There are a couple of stories about why the castle spire was drawn in such a manner. The first story involves a disgruntled Disney employee. Urban legend says that the employee working on the Little Mermaid project was informed he would be laid off. In retaliation against his employer, Disney, he included something hidden and controversial in the cover art that would come back to harm the Disney brand image. 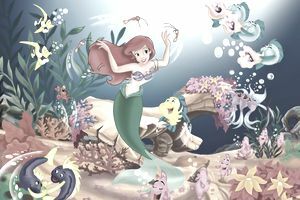 "We questioned the artist, who also drew artwork for Little Mermaid theatrical advertising, pop-ups, greeting cards, Happy Meal boxes, and CDs. The theatrical posters were done before the original release of the film, but the video cover art was not created until a few months before the home video version hit the market." The unfortunate mistake was on the cover for about a year, from 1990 - 1991, until an employee at a grocery store chain noticed the inappropriate castle spire and pulled the videos from their shelves. They contacted Disney about the issue, and the cover art was changed. VHS tapes with the original cover art are still in the homes of Disney fans and may be donated to thrift stores as people clean out or downsize. eBay sellers may find them at thrift stores, garage sales, library sales, even church sales. The average person doesn't know about the original cover art issue, and that it makes the videos produced in 1990 more valuable. The Little Mermaid VHS with original, also called "banned," cover art can sell for up to $300 on eBay. When searching completed listings, many sellers don't know to use the keywords original or banned cover art, so make sure those keywords are in the title and description area. Sellers will often list a batch of several Disney or children's VHS tapes, and this rare Little Mermaid version will be mixed in. It can be worth buying the whole lot just to pick out the special Little Mermaid VHS and sell it on its own. Just ask the seller of the lot for more photos of the covers to make sure the highly coveted VHS with the "special" cover art is included in the lot. Don't tip off the seller by only asking about the Little Mermaid tape. Ask for photos of several tapes in the lot. If you ask too many questions about a specific item in a lot, the seller might get suspicious, go do more research, figure out he has something of value, and end the listing. It is always a good idea to fly under the radar when asking questions about items you plan to resell on eBay. Happy hunting!